Recently, an organization from Manchester, England, United Cattle Products LTD., contacted me about posting news of their reprinting of an historic 1932 English book of tripe and cowheel cookery. Now, tripe is something I love to cook and to eat, and I never fail to indulge when given the chance. 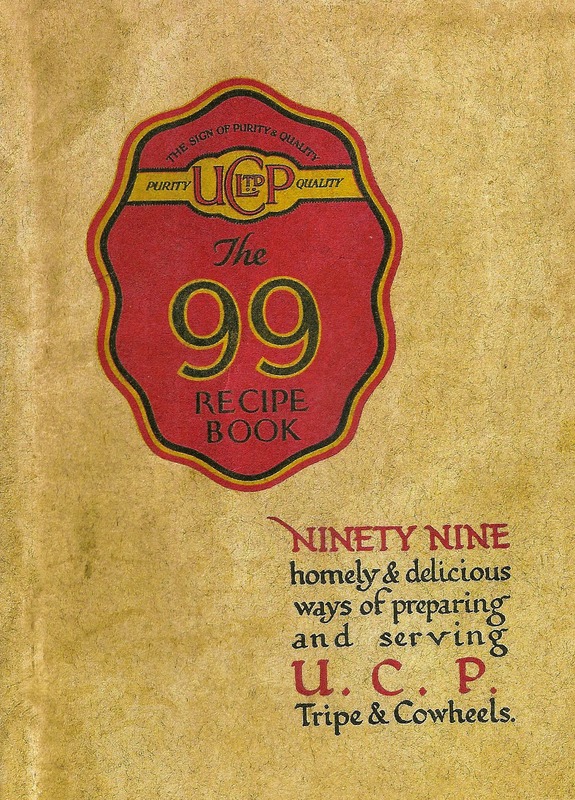 Many recipes for tripe exist -- the reprinted recipe book contains 99 of them! -- ranging from the simplistic Stewed Tripe with Onions, which is hardly more than its name, to the intriguing Tripe and Tomato Pie, an elaborately concocted, many-layered, long-cooked casserole. At Eccolo, we cooked Florentine-style tripe in our wood hearth, with tomato, garlic, dried ñora peppers, dusted at the end with grated Parmigiano cheese. This book is from the northern English kitchen of days past, and relies on onion, celery, parsley, flour, butter, and lots of boiling. It's a very different approach to our Italian one. Cowheel is what we in the U.S. call veal shank, and is cooked in much the same way as in contemporary American recipes, In earlier times, it was eaten often and believed to have restorative properties, with nutritional, health-building benefits. Two examples of recipes that might be shocking to our modern, more affluent palate, are "Cowheel and Sheep's Head Pie," and "Mincemeat," just as simple as it sounds. The first is completed by the addition of ketchup, with its balancing, acidic character; in the mincemeat recipe, the meat is tripe, no less, supported by the warming Medieval flavors of dried fruits, candied orange peel, spices, and suet. It is amusing to know that a book of 99 tripe recipes exists, utilizing an often overlooked and sometimes maligned part of the pig. It is not at all new that cooks and homemakers approach the pig with a nose-to-tail sensibility. However, such an approach and the tastes to support it were once not as much a matter of choice and privilege as they are nowadays, but more a matter of custom and practicality. And it didn't cost as half as much as it does now. SIGN UP FOR SAUSAGE POP-UPS HERE! "In-House Everything at Il Buco"
Send me an email message!